There is no replacement for the unique qualities that OHV recreation brings to our families and friends. Our healthy lifestyle is worth fighting for and yet, we continue to lose ground. Well funded environmental groups relentlessly continue to attack our already limited riding areas. It is time to end the apathy and take organized action. Now. Each of these organizations below have been formed to defend our rights as citizens and the future of our nations public and private riding areas. The organizations linked (by clicking their logos) below are not only the "big players" in the world of politics and land management, but they also have worked very hard to make your contribution to save your riding areas as easy as possible. While these organizations need our financial support, it is FREE to be involved in making a difference. It only costs you about 5 minutes of your time to make an impact. When you sign-up to receive "Action alerts" through their websites, you will get an email letting you know about an upcoming OHV legislative issue. You simply click on the hypertext in the email and it will direct you right to their email campaign notifying your elected representatives that you support Off-Highway Vehicle (OHV) recreation. It could not be any easier! The American Motorcyclist Association (AMA) has an excellent action department. They use their nationwide strength and resources to keep us informed on what's happening to our rights and riding areas. They do a lot of homework for us on National legislation issues. Take a few minutes and read up on what YOU can do to help. Their "Take Action" pre-written letters to officials are easy. Just do it! Click the logo. Oregon Motorcycle Riders Association. The OMRA is a great resource when it comes to OHV issues and events here in Oregon. Their website has a statewide calendar of events and a great forum full of resources. National Off-Highway Vehicle Conservation Council. The NOHVCC mission statement reads: NOHVCC, as a national body of OHV recreation enthusiasts, develops and provides a wide spectrum of programs, materials and information, or “tools”, to individuals, clubs, associations and agencies in order to further a positive future for responsible OHV recreation. Enough said. Great organization. The Blue Ribbon Coalition was started in 1987 by a citizen of Idaho, Clark Collins, who was concerned about the lack of importance given to recreational enthusiasts, by public land managers and government representatives. The Blue Ribbon Coalition has "grown up" to become a powerful voice for all types of outdoor recreation. 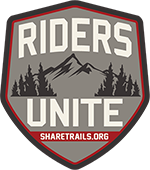 They are a great resource for promoting sustainable OHV recreation on public land. Click the logo. Americans for Responsible Recreational Access. ARRA focuses on the entire spectrum of issues surrounding the Crisis of Closure." They fight to keep our "Land of Many Uses" open for all types of recreational opportunities. Tread Lightly! is a non-profit group who's mission is "to promote responsible outdoor recreation through ethics, education and stewardship." They promote the practical idea that in order to continue to recreate on public and private land, we have to simply "Tread Lightly". That we are all part of the solution to make outdoor recreation sustainable. Their TREAD principles really spell it out: Travel Responsibly, Respect the Rights of Others, Educate Yourself, Avoid Sensitive Areas, and Do Your Part. Look at their website. Too often, we ignore opportunities to make a positive difference because we feel insignificant as individuals. Not true! As a collective, unified group we can make a huge difference. Typically, your "action" will be nothing more than writing a letter to a public agency or representative. That's our best tool for being recognized. Remember that legally, "If it's not written, it doesn't exist." Links to pertinent sites regarding our riding lands, rights and issues are presented below. Often, they have examples, templates and guidelines to facilitate composing personalized letters. Write on!